Males fight each other in often bloody, violent battles for dominance. They can weigh more than 5,000 lbs and reach lengths of 16 feet! Back from the Brink! Elephant seals were aggressively hunted to near extinction for their oil until legal protection was put into place, first in Mexico and then in the United States. Elephant seals can go without eating for 3 months. How long can you hold your breath? Elephant Seals can hold their breath for up to 2 hours by slowing their heart rate from 110 beats/minute to 20-40 beats/minute at depth and storing oxygen in their muscles. Shedding Old Skin! Elephant seals undergo catastrophic molting once a year when they shed all their fur and skin in large patches all at once. Other marine mammals continually replace old skin and hair throughout the year. Great Free Divers! Elephant seals are also one of the deepest diving air-breathing vertebrates known with recorded depths up to nearly a mile below the ocean surface!! A Mother’s Love! 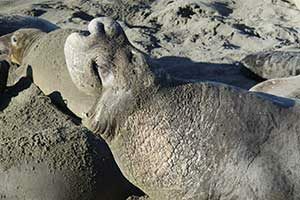 Mother elephant seals don’t eat for 4 weeks while nursing their pups and lose up to 42% of their weight.